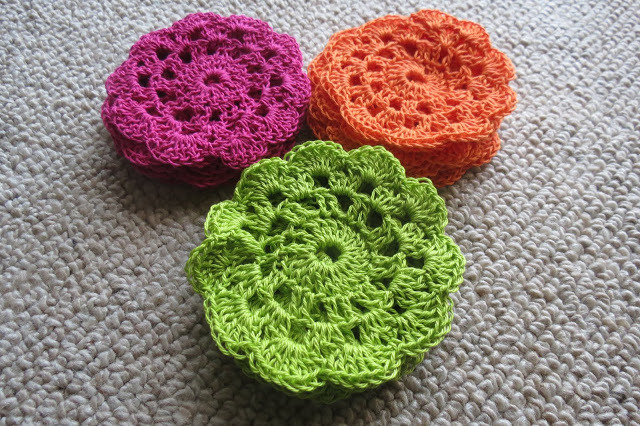 These pretty crochet coasters are quick and easy - really! A set of six takes about an hour to make. The original instructions for these coasters suggested using an 8 ply wool. I tried that but felt they were too thick and bulky, making them a little unstable for glasses. I've been using 4 ply crochet cotton and they are perfect. They sit nicely on tables and glasses and mugs don't wobble. Round 1. Make a slip knot. Insert hook and make 6 chain. Insert hook into first chain, yarn over, pull through both loops on hook. Make 3 chain; this forms your first stitch in the next round. 20 stitches. Round 2. Make 19 treble in circle. Insert hook into thrid chain from the bottom, yarn over, pull through both loops. Chain 3 (this is the first stitch of next round). Round 3. Make 1 treble in the next stitch. *Ch. 2, make 1 treble in next 2 stitches. Repeat from * end. Insert hook into third chain from the bottom, yarn over and pull through. Make 3 chain. Round 4. Insert hook into second space (ch. 2 space) and make 2 treble, chain 2, make 2 treble into same space. Make 2 treble, chain 2, make 2 treble into next space. Continue to lasat space. Make 2 treble, chain 2, 1 treble in same space, insert hook in third chain from the bottom, yarn over, pull through. Make 3 chain. Round 5. *Insert hook into ch. 2 space. yarn over, pull through. In next space make 6 treble. Repeat from * to end. Insert hook into space next to 3 chain. Make 5 treble. Insert hook into third chain from the bottom, yarn over, pull through. Yarn over, pull through, cut yarn approximately 10cm long, pull through to tie off. Thread darning needle with end of yarn. Weave loose end through work to tidy. If you Google "crocheted water bottle cover" you will find more patterns than you can cope with! If you don't have a computer, or a friend who will let you use theirs, your local library will have public access ones, as will your local community house. Patterns for knitting and crocheting covers for water bottles are available on knittingparadise.com and knitting.about.com. ​Try using a small round knitting loom to make these. You could also knit them on circular needles. Use double strand wool or yarn to make them thicker. Approximate $ Savings: $65 for lessons + $$$ for handmade clothing I wanted to learn to crochet - though I wasn't sure if I wanted to outlay the cost of learning to crochet at a craft store in case I didn't like it. I Googled 'Learn to Crochet' - and came across some great You Tube videos teaching all the basic stitches! So I sat in front of the computer with You Tube playing and taught myself the different stitches for free! I then Googled "Easy Crochet Patterns" and came across some great websites. I bought the yarn at discount stores to begin with - in case they didn't turn out. So far I have made a scarf for myself for $3, and child's beanie for $5 and a baby blanket for a gift - which will cost me $12 in total! I am currently making a pair of baby 'ugg' style boots - again about $3 to make and made in about an hour! I get the patterns for free on the Internet - and if there is stitching or terminology I do not understand in the pattern I Google the name of the stitch with 'how to crochet' following it and I always find a website with photos on how to complete that stitch. I am definitely hooked on crochet now!